I am interested in performing a lookup on the *date only*, with the intent of recasting the data in another tab within the same sheet. The destination tab has a prepopulated date which can be used to perform a lookup. However, as it is the date only the underlying numeric date value is distinct from the underlying date value populating the datetime stamp field in the form data. That combined with the way that VLOOKUP performs fuzzy matching means that the data retrieved is generally associated with the previous date. Here is an example showing that exact issue. What is needed is for the source datetime column to be evaluated for just the date part, or to evaluate for a matching substring. I don’t think hlookup and vlookup can do this. One possible way to do it is to add a column in the form’s sheet that performs the =INT(datetime stamp) operation and then point vlookup at that column, but I am reluctant to prepopulate the spreadsheet with that data because in my experience adding data to a form-derived spreadsheet causes the form to populate the next blank row beneath the data stored, and thus defeats my purpose. Writing this, I wonder if I can add a hidden field that performs this operation at submit, splitting datetime into date and time columns in addition to the datetime column. Beyond that, I was interested in learning how to perform the date extraction algorithmically anyway. I have seen similar questions posed that reference array formulae and the use of QUERY. I had thought given my desire to recast the data in a given additional tab with various hardened formatting features an array formula is not what I want, but I was open to suggestions. I resolved this on my own. The solution was to add two columns in the form’s destination sheet, DATEINT and TIMETEXT. I have placed them as column B and C.
The array formula autofills down the sheet on the populated rows and will extend as data is added to the field. It does not impede form data collection. This answer on the forums was helpful. Researching this solution, implementing it, and writing about it took about an hour and a half. A wonderful, enthusiastic review of Helen Macdonald’s H is for Hawk in this week’s New Yorker. Metafilter takes a look at the forgotten and reviled 1973 generation-ship SF series The Starlost, which I have never heard of. Sounds totally fascinating, combining elements also seen in Silent Running, Space: 1999, Logan’s Run, Roddenberry’s Genesis II, and of course the original Battlestar Galactica. Boy, mainstream TV SF sure had a hardon for the apocalypse, didn’t it? Alien star system buzzed the Sun, BBC. 70,000 years ago? Good lord, that’s conceivably within the historical horizon of human civilization, not simply human biology. The article does not spell it out, but no, not that Lucinda Williams. This one call illustrates a statistical regularity: Umpires are biased. About once a game, an at-bat ends in something other than a strikeout even when a third strike should have been called. Umpires want to make the right call, but they also don’t want to make the wrong call at the wrong time. Ironically, this prompts them to make bad calls more often. Ha, is this turning into a baseball blog? Man, I gotta recode the posting bookmarklet, it ain’t cutting it. The innings and pitches just kept piling up. In one stretch of five starts in 2009, at age 20, Tanaka threw 124, 137, 142, 125 and 137 pitches. Angels ace Jered Weaver hasn’t thrown 124 pitches in a game that many times in his entire eight-year career, covering 231 starts. Two years later, in just the second week of spring training, Tanaka threw 520 pitches over five throwing sessions that spanned seven days, capped by a 207-pitch bullpen only two days after a 120-pitch session. My old college chum Lawrence Wells and I have been goofing on each other on Twitter (I refer you to the inevitable Twitter digest, of course). 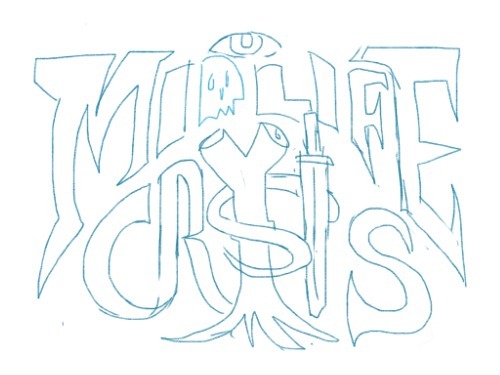 He bruited a terrible metal band named “Midlife Crisis,” and I flung him a backpanel logo sketch promptly. I post it here so I can find it easily later. I don’t think we’re actually gonna do the collaboration but I do want to hear his music.